Central to the organization of your information in Business Contact Manager for Outlook are Account and Business Contact records because they store contact information about the people you do business with. Most of the other record types must be linked to them. This article lists the Business Contact Manager for Outlook record types and indicates which records you can or must link to other record types. For information about how to link the records, see the article about that record type. Account An Account is a business or organization with which you do business. If you provide a service to the Account, such as a medical or dental service, an Account can also be a customer. For more information about Account records, see Store information about your Accounts in Business Contact Manager. Business Contact A Business Contact is a person at a company or organization with whom you do business. A Business Contact can be linked to an Account, but doesn't have to be. For more information about Business Contacts, see Use Business Contacts in Business Contact Manager. Lead A Lead is a person who is potentially interested in purchasing the products or services your business offers. Typically, leads are qualified to give sales staff an idea of whether a lead might become a paying customer. A Lead is a type of Business Contact record because the Lead form, through customization, is based on the Business Contact form. For information about creating your own record types, see Create and customize record types and lists. Opportunity An Opportunity is the record of a potential sale of your products or services to an Account or Business Contact. Each Opportunity lists the products or services that interest your customers. Opportunity records must be linked to an Account or Business Contact record type. For more information about Opportunity records, see Track potential sales opportunities in Business Contact Manager. Marketing Activity A marketing activity, such as a call list or targeted e-mail, allows you to plan and track communication activities to accomplish a business result, such as increasing market share, introducing a new product, or retaining customers. Marketing activities stand alone, but can be linked to various record types to track the records and revenue that the marketing activity generated. For more information about marketing activity records, see Market your products and services in Business Contact Manager. Business Project A Business Project represents a single undertaking such as putting on sales conference or completing a landscaping project for a customer. The business project is usually comprised of a series of tasks that will help you reach your goal. Business Projects must be linked to an Account or Business Contact record type. For more information about Business Projects, see Organize business projects in Business Contact Manager. Project Task A project task is a work item that is part of a Business Project. For more information about Project Task records, see Use project tasks in Business Contact Manager. Communication History items A communication history item, such as an e-mail message, file, or phone log, enables you to track your communication activity with an individual Account or Business Contact. Communication history items must be linked to an Account or Business Contact. For more information about communication history items, see Track your communications with customers in Business Contact Manager. Note: You can create your own record types that are based on either the Account or Business Contact record type. For information about customizing records, see Create and customize record types and lists. Link Business Contact Manager for Outlook records together to create relationships between them and easily access related information. Most record types, except for marketing activities and project tasks, must be linked to an Account or Business Contact. This means that before you can save a record, you must select the Account or Business Contact to link. The communication history of Account and Business Contact records list the communication history of all the other records that are linked to them. The following table shows which items can be linked to each record type. Note: Project tasks are included in the communication history of an Account record, but they cannot be linked directly to the Account record. Project tasks are listed because an Account record inherits the Project tasks of linked Business Projects. (Parent) Account. Link to Account is optional. 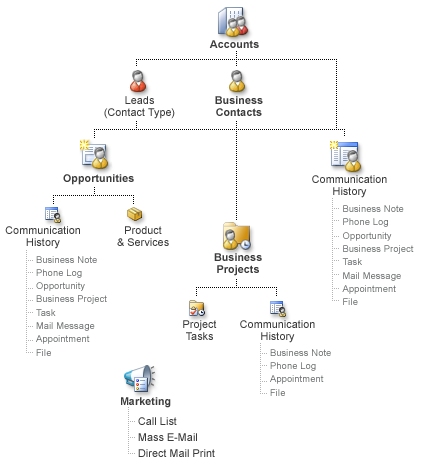 Note: Project tasks are included in the communication history of a Business Contact record, but they cannot be linked directly to the Business Contact record. Project tasks are listed because a Business Contact record inherits the Project tasks of linked Business Projects. Can be associated with a marketing campaign. Can be associated with Account, Business Contact, Lead Opportunity, records for tracking by selecting the name of the marketing activity in the Initiated by field on Account and Business Contact records.